Are you ready to learn about the different lung infections? How about the principles of infection prevention and control? Well I sure hope so, because that is what this study guide is all about. Let’s go ahead and dive right into some practice questions. Keep in mind — this information correlates well with Egan’s Chapter 4 and Egan’s Chapter 24. So you can use this information as a study guide for your exams. What are the types of Lung Infections? Pulmonary Infections of the lung cover a wide range of illnesses with a variety of different origins. Lung infections can be caused by a virus, fungus, or bacteria. In the practice questions below, we will discuss the different types of lung infections. Not only that, we will also cover how to prevent and control these pulmonary infections as well. It is a viral infection (also called “the flu”) that is spread via droplets. It attacks the respiratory system — nose, throat and lungs. An inflammatory process of the lung parenchyma that is usually infectious in origin. It is an infection that can be caused by bacteria, fungus, or a virus. Many factors can affect how serious pneumonia is, including the germ causing the infection. It is a disease caused by a bacteria called Mycobacterium tuberculosis that attacks the lungs. Also called TB, spreads through via airborne when a person with TB coughs, sneezes, or talks. It is a viral infection of the airways of the lungs, that causes them to become irritated and inflamed. 5. What are the three infection control strategies? (1) Interrupting routes of transmission, (2) eliminating the source of pathogens, and (3) specialized equipment processing. 6. Knowing if the infection is gram-negative or positive helps with what? It helps with selecting the proper antibiotic. 7. What three elements that must be present for transmission of infection within a health care setting? A source (or reservoir) of pathogens, a susceptible host, and a route of transmission. 8. What is the name for infections that are acquired in the hospital? 9. What is the term for inanimate objects that may serve to transfer pathogens from one person to another? 10. What precautions are used to prevent a form of contact transmission that occurs when droplets are propelled short distances (within 3 feet or less through the air)? 11. What are four categories of Expanded Precautions? Contact Precautions, Droplet Precautions, Airborne Infection Isolation, and Protective Environment. 12. Hand hygiene includes both handwashing with either plain or antiseptic-containing soap and water for at least how many seconds? 13. What are the precautions that are to be applied to the care of all patients in all health care settings? 14. What is the practice of grouping patients with the same infection? 15. What is an ongoing process of monitoring patients and health care personnel for acquisition of infection and/or colonization of pathogens? 16. What are methods that kill bacteria? 17. What is the size of droplet nuclei? 18. How many infections do hospital-acquired (HAIs) account for annually? An estimated of 2 million infections. 19. What is the best choice for high-level disinfection of semi-critical respiratory care equipment? 20. Among respiratory care equipment what has the greatest potential to spread infection? 21. The use of what is part of routine care when there is skin care? Gloves, of course. Always wear gloves! 22. List three general barrier methods used to prevent exposure to organisms? 23. Ventilator circuits may be used up to how many days before they need to be changed? 24. What type of water should be placed in the nebulizer? 25. The best way to prevent the spread of infection in the ICU is to? Wash your hands after every patient contact. 26. What should be worn to treat patients with tuberculosis? 27. Where are cavitary infiltrates are seen? They are seen in Reactivation Pulmonary TB, Fungal pneumonia, and rarely in P. Jiroveci. 28. What is hospital-acquired pneumonia? A lower respiratory tract infection and develops in patients hospitalized for more than 48 hours after an ET tube is placed. Any person who is hospitalized for 2 or more days and in the past 90 days or a person who has in the past 30 days resided in a nursing facility, attended a hospital or clinic hemodialysis, iv antibiotics, chemo, or wound care, and gets an infection. 30. In HIV urban settings, what is the most common cause of pneumonia? Small cavities developed from severe staph or gram-negative bacteria. 33. What is the most common Community-acquired Pneumonia? 34. What percentage of pneumonia goes undiagnosed? 35. Why is there a 50% rate of microbiologic diagnosis? No sputum production, Failure to perform serological tests on patients, Many organisms are not routinely sought, Failure to recognize new pneumonia pathogens. 36. What is a Health Care Associated Infection (HAI)? Infections that patients acquire during the course of medical treatment. Approximately 5% of all patients admitted to a hospital develop an HAI. Also note that 15% of HAIs are pneumonia. 37. What is the aim of infection control procedures? To eliminate the sources of infectious agents. To create barriers to their transmission, and to monitor and evaluate the effectiveness of control. 38. What 3 elements must be present for transmission (within a healthcare setting)? (1) a source (of pathogens), (2) susceptible host, and (3) route of transmission. 39. What/who are the primary sources for infectious agents in the healthcare setting? Humans; however inanimate objects have also been proven to cause transmission. 40. When a person serves as their own source of infection? 41. Where do most nosocomial pneumonia’s occur? Surgical patients; particularly if they have had chest or abdominal procedures. In these patients normal swallowing and clearance mechanisms are impaired, allowing bacteria to enter and remain in the lower respiratory tract. 42. Why are patients with an artificial tracheal airway at high risk for nosocomial pneumonia? Typically they require prolonged intubation, and may already have one or more factors predisposing them (such as COPD). Another risk factor may be increased upper airway colonization with gram-negative bacteria. Also, handling of these tubes increases the likelihood of cross-contamination. 43. What are the 3 major routes for transmission of human sources of pathogens in the health care environment? (1) contact (direct/indirect), (2) Respiratory Droplets, or (3) Airborne Droplet Nuclei. 44. What is Contact Transmission? The most common route of transmission. Two subdivisions are direct and indirect. Proper use of gowns and gloves are ost commonly employed to decrease the spread of multidrug-resistant organisms, such as Clostridium difficile. 45. What is Direct Contact Transmission? Occurs when a pathogen is transferred directly from one person to another. This occurs less frequently than indirect but is more efficient. For example; the development of RSV bronchiolitis in a bone marrow transplant recipient can occur from the transmission of the virus from an ill health care worker who did not perform appropriate handwashing before care. 46. What is Indirect Contact Transmission? It is the most frequent mode of transmission in the healthcare environment and involves the transfer of a pathogen through a contaminated intermediate object or person. It most commonly occurs due to poor or the lack of handwashing. Inanimate objects that serve to transfer pathogens from one person to another. 48. What are the sources of infectious agents? Humans are the primary source. Inanimate objects (e.g., contaminated medical equipment) can spread infection. Individuals in the hospital capable of being source include workers, visitors, and patients. 49. How can the health care worker interrupt the route of transmission of pathogens? Special equipment handling, Barrier/isolation precautions using both standard and transmission based precautions, and Standard Precautions. 50. What are Standard Precautions? They are intended to be applied to the care of all patients in all health care settings, all the time. Standard precautions apply to blood, all body fluids, non-intact skin, and mucous membranes. It stands for Personal Protective Equipment. It refers to various barriers and respirators used alone or in combination to protect mucous membranes, skin, and clothing from contact with infectious agents. 52. Gloves must be sterile when? 53. Masks protect mucosal surfaces against what? Splashes or sprays but should not be confused particulate. 54. What is the N-95 Respirator? Intended for diseases that could be airborne transmitted. 55. Gowns provide barrier protection and can prevent what? They can prevent contamination of clothing and exposed body areas. 56. What are Droplet Precautions? They are in place to prevent form of contact transmission that occurs when droplets are propelled short distances, such as influenza that is generated via coughing, sneezing, suctioning, bronchoscopy, and cough induction. For these precautions, a surgical mask must be worn. 57. What is Airborne Infection Isolation? The act of grouping patients with the same infection together to confine care geographically and prevent transmission to other patients. 59. What is Cleaning in regards to infection control? Cleaning is the first step in all equipment processing. It involves removing dirt and organic material. The failure to clean equipment properly can render all subsequent processing efforts ineffective. Soaps and detergents need to be used. 60. What must we do with non-critical items, such as commodes, intravenous pumps, and ventilator surfaces? They must be thoroughly cleaned and disinfected before use with another patient. Describes a process that destroys the vegetative form of all pathogenic organisms on an inanimate object except bacterial spores. Disinfection can involve either chemical or physical methods. It is the most common physical method of disinfection. 63. What is Chemical Disinfection? Chemical disinfection involves the application of chemical solutions to contaminated equipment or surfaces. The process that destroys all microorganisms. It can be achieved with physical and chemical approaches. Steam sterilization is most common and easiest. Low-temperature sterilization technologies include ethylene oxide, which is a colorless and toxic gas. 65. Medical devices contacting with sterile body tissues or fluids are critical items that what? They should be sterile before use. 66. What is Steam Sterilization? Moist heat in the form of steam under pressure is the most common, most efficient, and easiest sterilization method. (autoclaving = steam under pressure). 67. What are some equipment handling procedures that help prevent the spread of pathogens? Maintenance of in-use equipment, processing of reusable equipment, application of one-patient use disposables, and fluid and medication precautions. 68. What are some in-use respiratory care equipment that can spread pathogens? Nebulizers, ventilator circuits, bag-valve-mask devices, and suction equipment. 69. What are the 3 major issues of disposable equipment? Cost, quality, and reuse (i.e. if people try to use the item again, it raises significant safety concerns). 70. What are four infections that are spread via direct contact transmission? (1) Hep. A, (2) HIV, (3) Staphylococcus, and (4) Enteric Bacteria. 71. What are four infections that spread by indirect contact transmission? (1) Pseudomonas aeruginosa, (2) Enteric bacteria, (3) Hep B and Hep C, and (4) HIV. 72. What are the infections that spread by droplet transmission? Pneumonia, Neisseria meningitides (pneumonia), Diptheria, Pertussis, Influenza, and MMR. 73. What are the infections that spread by airborne transmission? Legionellosis, TB, Varicella, Measles, and Smallpox. 74. What are some factors that can enhance susceptibility to infection? Diabetes, extremes of age, obesity, underlying HIV infection. 75. Which patients are more at risk for pneumonia? Elderly, obese, COPD, and patients with an artificial airway. 76. What is the most difficult and least feasible approach to infection control? 77. What vaccine does OSHA mandate that employers provide? 78. What is the best way to decrease host susceptibility to a device-related infection? Limit device use, and Ensure that the devices are placed and maintained properly. 79. What do infection control procedures aim to do? Eliminate the sources of agents, create barriers to their transmission, and monitor the effectiveness of control. 80. What are the steps in decreasing host susceptibility? Shots, ventilators, limit the use of devices, and prevention bundles. 81. What are the steps to interrupting the route of transmission? Special equipment handling, barrier precautions, and disposable equipment. 82. What is the importance of surveillance? To ensure that there is no ongoing problem or to detect problems and intervene to prevent transmission of pathogens in the health care environment. 83. What are the 4 categories of expanded precautions? Transmission based, airborne infection isolation, protective environment, and patient placement and transport. 84. What are the three risk categories applicable for medical equipment? 85. What is high-level disinfection? The inactivation of all microorganisms except bacterial spores (with sufficient exposure times, spores may also be destroyed). So there you have it. 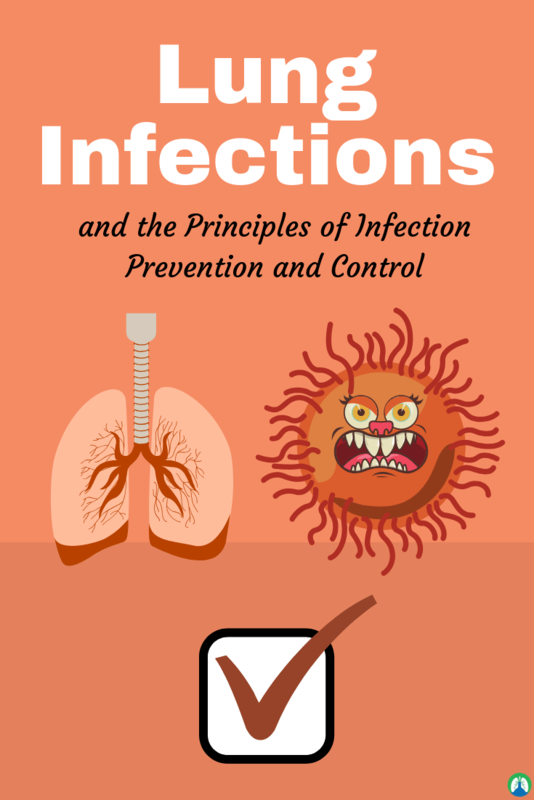 That wraps up our study guide on Lung Infections, preventions, and control. I hope this information was helpful for you. Like many other students, you can use these practice questions to help prepare for your exams. Just be sure to go through them until you truly know the information.